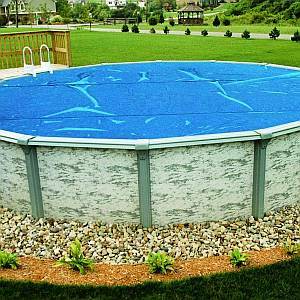 Our durable above-ground blankets can warm your pool this year by up to 15 degrees F. Our blankets are made to give you maximum heating properties combined with long life. Our 8-mil blankets are loaded with thermal bubbles that retain heat at night and on cool cloudy days. Our transparent blue color allows the maximum amount of solar rays to reach you pool for optimal heating. All of our blankets are U.V.-protected so they last under the most intense sunlight. Built to last and backed by a 3-Year Warranty.